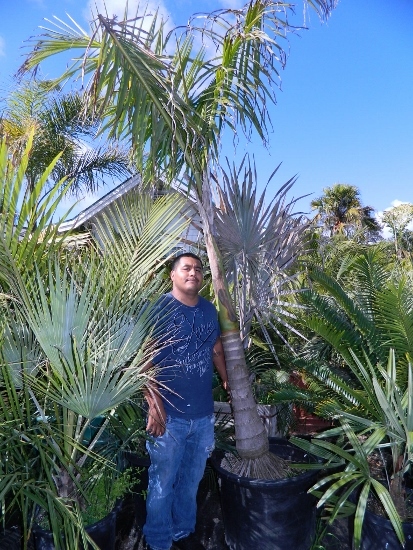 Roystonea regia, the Cuban Royal Palm, is quick growing, majestic and tall, single trunk and crown shafted palm - it is known the world over. 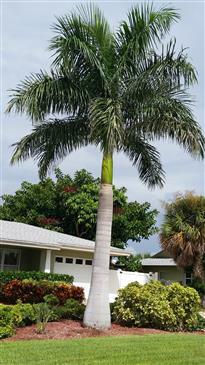 It is a centerpiece palm used as a single specimen in private gardens, for lining a long driveway or parkway, or for size and grandeur in a botanical garden. Historically, Californians did not think it could be grown here. But, in the last fifty years there are at least a hundred specimens being grown throughout Southern California. This article introduces this spectacular palm species and gives cultural information to help the reader. Roystonea is a genus of "Royal Palms". 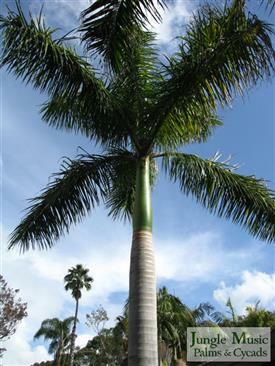 There are multiple types or species of Royal Palms with native habitats stretching from south Florida to South America. Of these multiple species of "Royal Palms", the most common species and the one you are most likely to see is the Cuban Royal Palm, often just referred to as the Royal Palm. It's scientific (Latin) name is Roystonea regia. In years past the plants native to southern Florida were thought to be a separate species, "Roystonea elata". 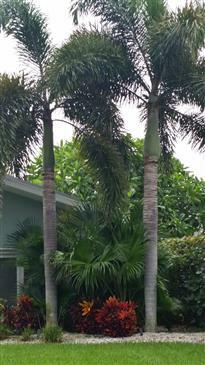 However, further study proved that these Florida palms were indeed identical to the Royals in Cuba, R. regia. 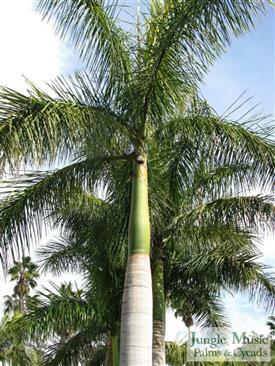 Thus, Roystonea regia and elata are the same species. Species native to some Caribbean localities and South America are different morphologically and have different species names. 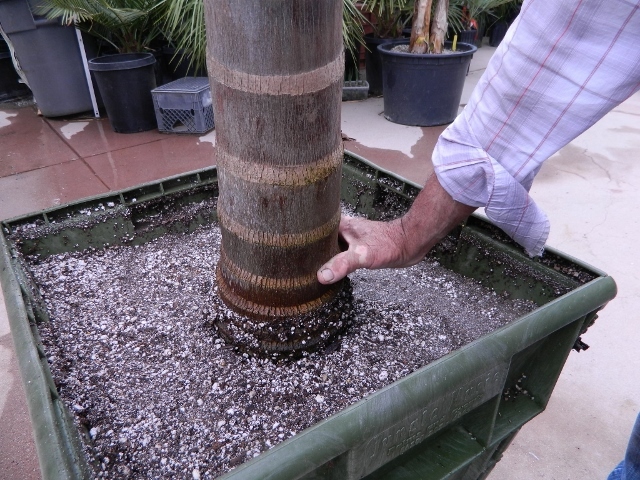 I'll show a few pictures of other species below, but the main emphasis of this article is on Roystonea regia, the Royal Palm. Also included is cultural information on how to grow Royals. 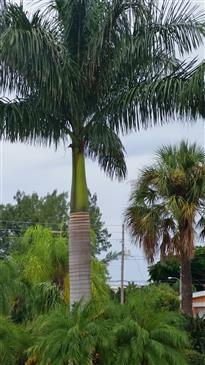 This is a single trunk, pinnate palm (feather palm) with a prominent, long and green crown shaft. Roystonea is a genus containing about ten or eleven species with distribution from south Florida through Central America, South America and some Caribbean islands. This article is concentrating on the species Roystonea regia. 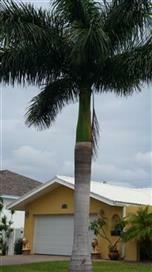 The Cuban Royal Palm is the most commonly seen Royal Palm worldwide. 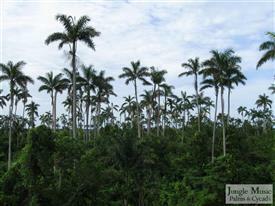 In their own localities, all the different species of Roystonea are called the "Royal Palm" but local inhabitants. But, their species may look a bit different than the Cuban Royal. 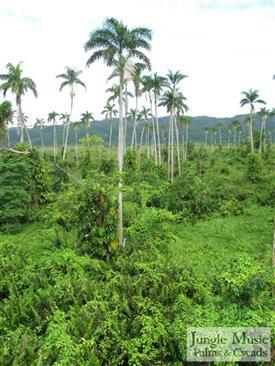 Native habitats includes Southern Florida, Cuba, Central America and some Caribbean islands. In almost all areas of Southern California, this species demands full and hot sun. It hotter desert areas it is possible to grow Royal Palms in less sun, but not shade. In our locality, heights are difficult to predict as many palms are not fuller mature and old. One should certainly expect heights of forty feet or more in many decades. Plants in habitat are taller than this, sometimes more than seventy feet. The leaves of the Roystonea regia average about ten feet long. They are not armed. They have short petioles and the leaf color is green. In cross section the leaves are rather plumose (fluffy). Below the leaves is a long, smooth tubular crown shaft. This prominent bulge in the upper trunk is just below the leaves. Just below this structure is where one would see flower spikes. This crown shaft is smooth, green in color and rather elongated compared to some crown shafts. It is very attractive and one of the hallmarks of the species. The crown shaft is formed by the most proximal part of the entire leaf stem wrapping around the trunk. The leaves are a definite green in color. They are never silver or white and both sides of the leaflets are the same color.. 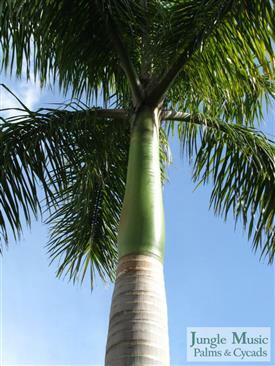 The trunk of Roystonea regia is one of the other hallmarks of the species. It has a white or gray color and typically swells at the base, sometimes showing some random bulging further up the trunk with time. Basal diameter of the trunk can reach 30 inches or more. Mid trunk diameter probably averages 18 inches with greater diameter where it bulges. 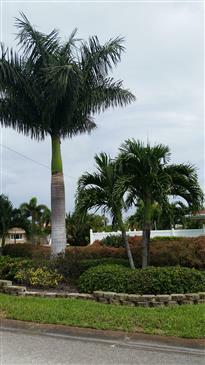 Typical of crown shafted palms, when leaves age and turn brown, they simply fall to the ground. This is good from a labor point of view. But, it also poses a bit of risk to a delicate garden floor below or people. The crown of leaves of the Cuban Royal when viewed from afar tend to hang downwards and sometimes even hang close to the trunk, almost giving a 360 circle to the crown as a whole. Compare this to the South American Royal (Roystonea oleracea) which classically has a crown of leaves that rarely extend downwards pass the "mid-crown point". Thus the latter crown of leaves is the top 180 degrees of a circle. The Cuban Royal will tolerate a freeze. It's minimal tolerated temperature is somewhere around 25 degrees F., similar to a King Palm. But, there are living plants in areas other than Southern California where this species has tolerated (or at least survived) temperatures colder than 25 degrees. Roystonea regia is remarkable how it tolerates high heat. People in desert areas such as Palm Springs and Phoenix are successfully growing this species if it is given adequate water. This would be a difficult palm to grow in an area where there is no summer heat. The fruits of the Royal Palm are small in size, typically a dark purple or black, with an even smaller tan colored seed under the fruit. Medium to fast growth rates are typical. Growth is much faster in the ground than in a nursery pot. As mentioned above, there are at least ten or more other species. This number varies with the taxonomist. Examples would be Roystonea violacea (Cuba), Roystonea princeps (Jamaica), Roystonea oleracea (South America), Roystonea borinquena (Puerto Rico and Hispaniola) and others. Pictures are shown below of some of the other species. Cuban Royals look great no matter where and how you plant them. They can be used as a centerpiece specimen. They are wonderful along streets or long driveways. Most folks in Southern California plant them as a single, sometimes on both sides (opposing) of a garden area. Some have even planted small colonies of three together although this is rarely seen. Some local landscape architects in their plans call for huge Royals with ten feet of brown trunk. Unfortunately, these are rarely available in our locality. Such plants would require being field grown and later dug. Digging of field grown plants has its risks with an anticipated 50% mortality rate with the Royal Palm. Digging has better results in Florida (or other tropical areas), but such dug Florida plants cannot be legally imported into California. But, as Royals are quite fast growing, we recommend getting the size you can. In a matter of a few years, your plant will be much larger. contraction. 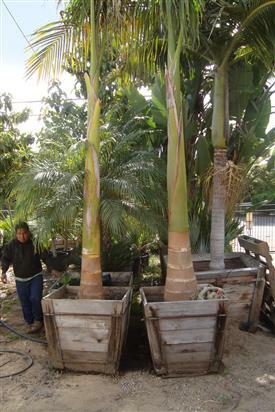 The pictures below demonstrate characteristics of Roystonea regia trunks. Also note the very light, gray/white color of the trunk, another characteristic. 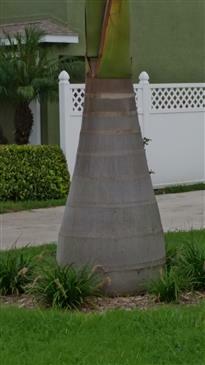 The crown shaft of the Royal Palm is a clean, prominently green color and long and smooth. on their own or can be easily removed if the leaf is dead. BUT, ALL ARE TYPES OF "ROYAL PALMS", IN THE GENUS "ROYSTONEA"
(10 minutes south of Oceanside, 30 minutes north of San Diego). Exit Leucadia Blvd West (toward ocean). To be added to our mailing list click here.t color="#3366FF" face="Arial" size="2"> Receive quarterly species lists and announcements of Jungle Music's famous Open House Sales!